Finally my e-ink display arrived and I had some time to test it. At the first look it redraw the screen in about 1 second, consume very little when changing the display and nothing between the changes. I will connect it to my battery operated Temperature and humidity sender so I can see the values during the sleep time. 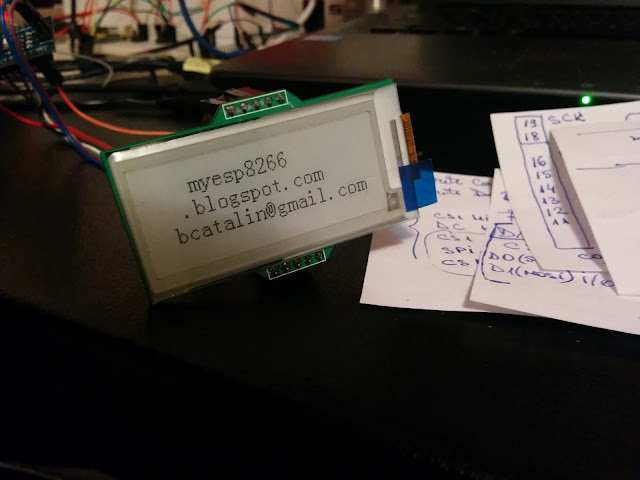 Labels: DHT22, E-ink display, Eink, ESP8266, IoT display. What is type/model number of e-ink or where to buy? Thanks. where i can get the syntax and program tutorial?